Before he was a journalist or a public school teacher or administrator, and before he was my husband, Lloyd Brinson was a young U.S. Marine officer who served in Vietnam. He finds much that’s worthwhile in a new book by a writer who was a young soldier in a different war. PUMPKINFLOWERS: A SOLDIER’S STORY. By Matti Friedman. Algonquin Books of Chapel Hill. 242 pages. $25.95. Welcome to Matti’s world… and to Avi’s… and Eran’s… and Mordecai’s and…. on and on – a seemingly endless roll call of Jewish teenagers doing their obligatory time in the Israeli Army to protect the artificial borders of that country from her neighbors in the 1990s. 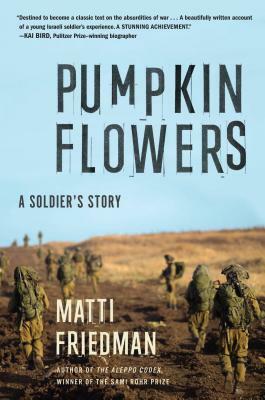 After basic training – aka boot camp – Avi and Matti and the other boys-turned-soldiers in this story were sent to man The Pumpkin, the name of an outpost on a hill in Lebanon, ostensibly placed to deter terrorism. As the story progresses, the reader begins to see how the Hezbollah used the Pumpkin and the other botanically named outposts to train personnel, experiment with tactics and exploit the Israelis, turning that “Party of God” into the powerful threat it is today. Few of us – even those of us with combat experience – enjoy spending much time reflecting on the absurdities, atrocities and contradictions of warfare. Even fewer people who enjoy books want to be handed a platter of hors d’oeuvres detailing the human suffering of the participants of war and the agonies of the innocent – and some not so innocent – bystanders. But this tale of the life and death of the Pumpkin – and the lives and deaths of its inhabitants — is such compelling reading that I wish it could be required reading for anyone running for public office in any civilized country. “Flowers” meant trouble. When the young soldiers – many of them teenage girls doing their time – at the operations center in Jerusalem heard the radio operator from the Pumpkin say “flowers,” they sent helicopters, to pick up the wounded (flowers) and fly in replacements. “Oleanders” were worse news. Those were the dead. Matti survived his time on the Pumpkin, became a journalist and is still trying “to remain safe as long as possible.” You’ll have to read this little masterpiece to find out about the others… and to find out about the ultimate fate of the Pumpkin. The rest is still a work in progress. This entry was posted in Contemporary Nonfiction, memoir, Military, Military History and tagged Israeli wars, Matti Friedman, Middle East, military-history, Pumpkinflowers. Bookmark the permalink.